I love to cook. Spotting me cooking without a glass of wine in-hand is a very rare sighting, and every now and then the wine that I’m savoring will be used as a key ingredient in the meal I’m preparing. During the hot summer months, my grilled fish or shellfish will inevitably be enhanced by the addition of whatever crisp, dry white wine is in my glass: Albariño, Vermentino, Chenin Blanc or Grüner Veltliner (to name just a few) invariably adds a dash of zippy acidity and flavor. 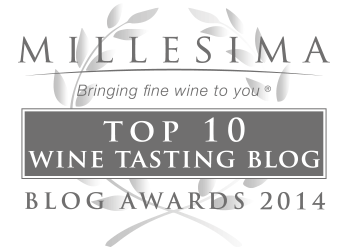 During the fall months, the wine I drink most often is a bit richer and more complex than my summer picks. Chardonnay, Riesling, Friulano, White Pinot Noir, Rosé of Pinot Noir (Rosé is delicious with roasted acorn and butternut squash), Pinot Noir and Gamay Noir are just some of what I reach for when I sit on my front porch in the late afternoon, wrapped in a blanket, watching the leaves slowly descend from the swaying branches of my most favorite tree. 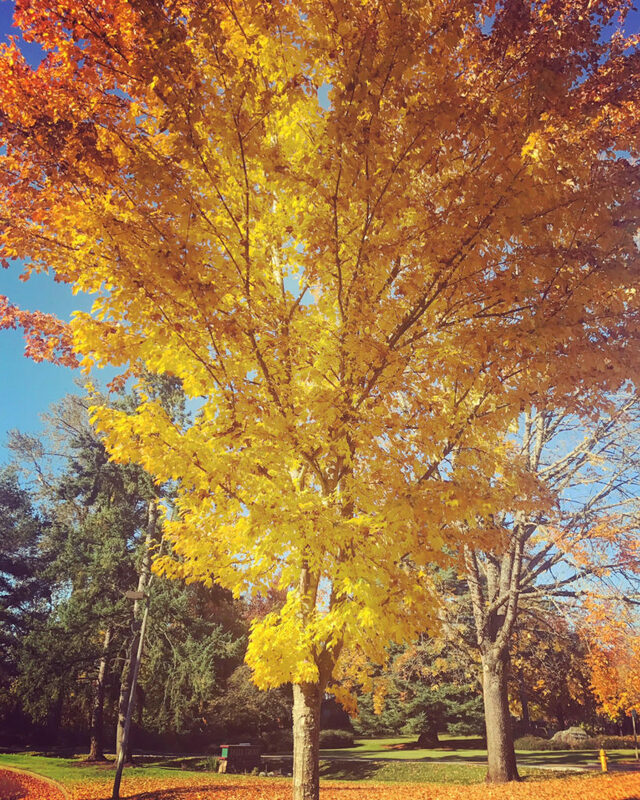 watching the leaves fall from my front porch from this beauty of a tree that makes quite a statement each fall. I look forward to it annually. Just a couple days ago, I watched the last few leaves fall from that beloved tree before heading inside to start dinner. 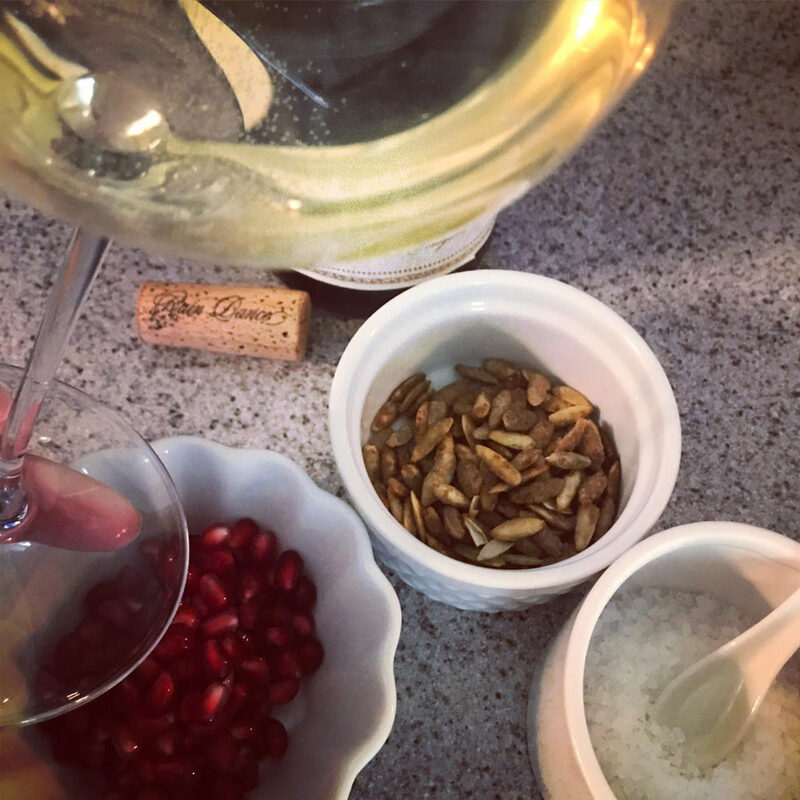 I was making one of my favorite fall dinners, Roasted Acorn Squash with Maple Sage Sausage, and I decided a side salad would be a good fit with both the roasted squash and the Chardonnay that was in my glass. 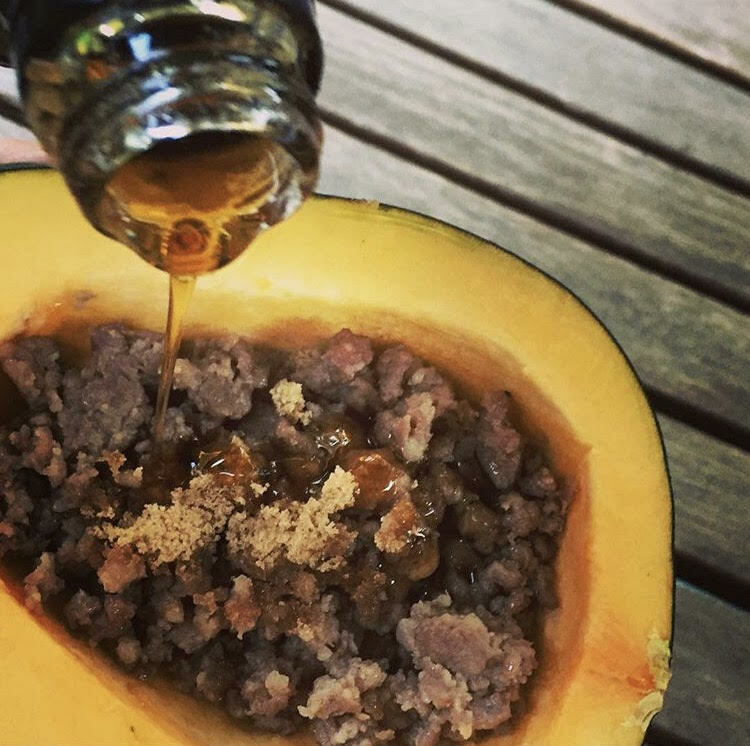 My favorite fall meal is this tasty roasted acorn squash with maple sage sausage. 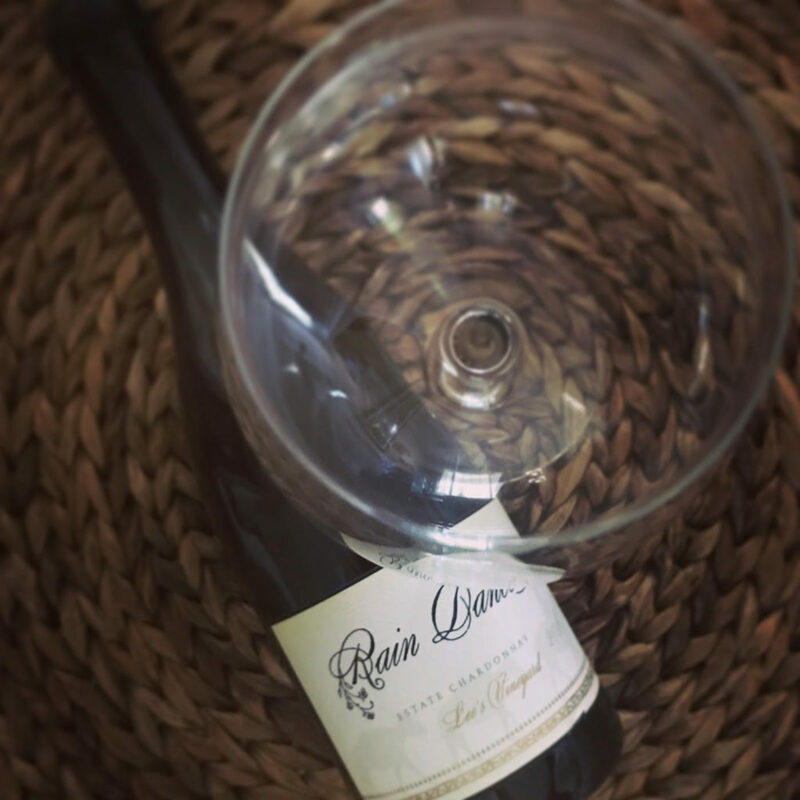 Rain Dance Vineyards 2016 Lee’s Vineyard Estate Chardonnay is what I call a “fall” Chardonnay. An example of a “summer” Chardonnay would be one that is stainless steel fermented with no oak treatment – light bodied, crisp and brimming with zippy acidity. The perfect wine to sip on a hot summer day, no food required – shoes off, feet up and soaking in the summer sunshine. A fall Chardonnay has spent some time in oak barrels – giving it a rounder, richer texture with greater depth of character. Still brimming with bright acidity to round out the supple mouth feel, fall Chardonnays with their creamy textures beckon food. 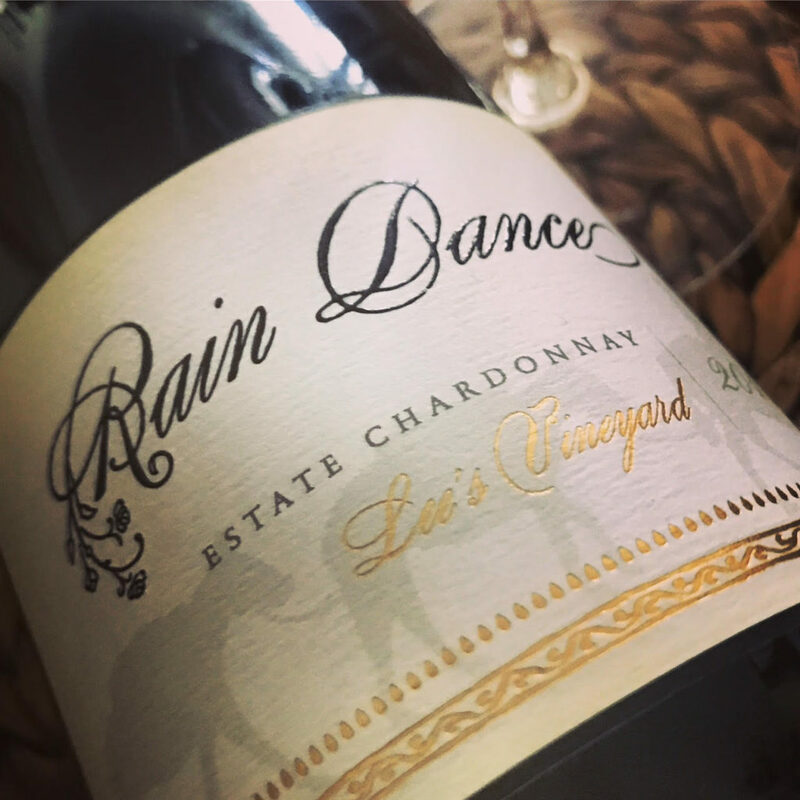 Rain Dance Vineyards 2016 Lee’s Vineyard Estate Chardonnay ($45) was aged in 50% new French oak barrels and 50% Neutral French oak barrels, giving it a lush and juicy character that coats the palate with a beautiful silky texture. This unfiltered and hand bottled 100% Dijon clone 95 showcases alluring woven layers of aromas and flavors flow in a lush wave from the front of the palate to the back – baked pear, clover honey and fall spices coat the mouth in delicious balanced harmony with a touch of lemon zest on the finish. Minerality gives it a sense of place, showing off its terroir. Before it became too cold to enjoy sitting on the front porch, I came inside to the magnetic aromas of the acorn squash roasting in the oven. Squash, brown sugar, sage and maple aromas filled the air, inspiring me to create a salad that would be chock-full of fall fruits and spices. 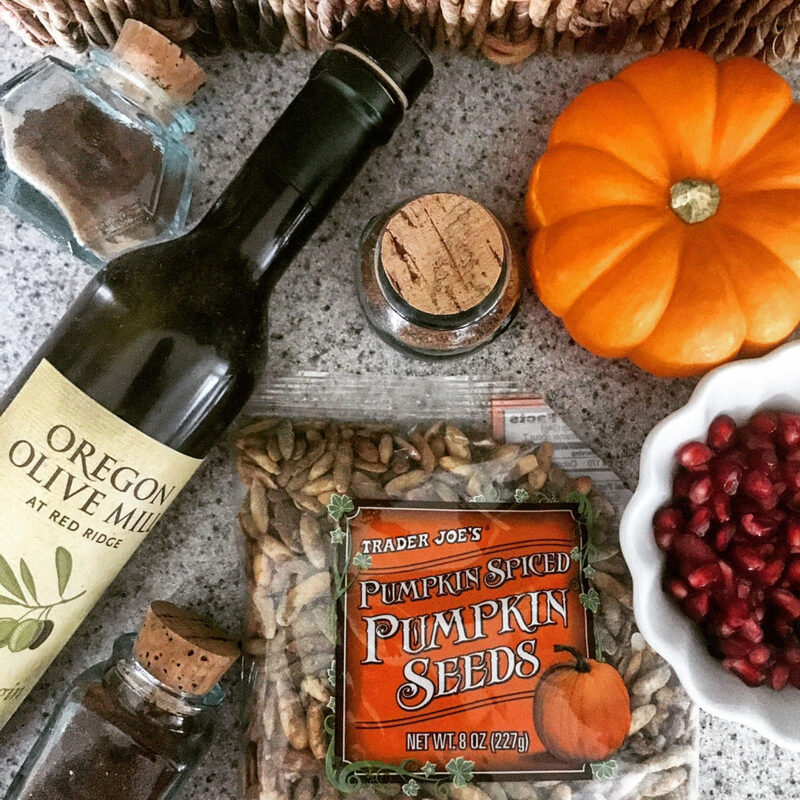 In the fridge, I collected some fresh wild arugula, a locally grown pear, pomegranate bits, honeyed goat cheese – and for added crunch – a bag of Pumpkin Spiced Pumpkin Seeds. 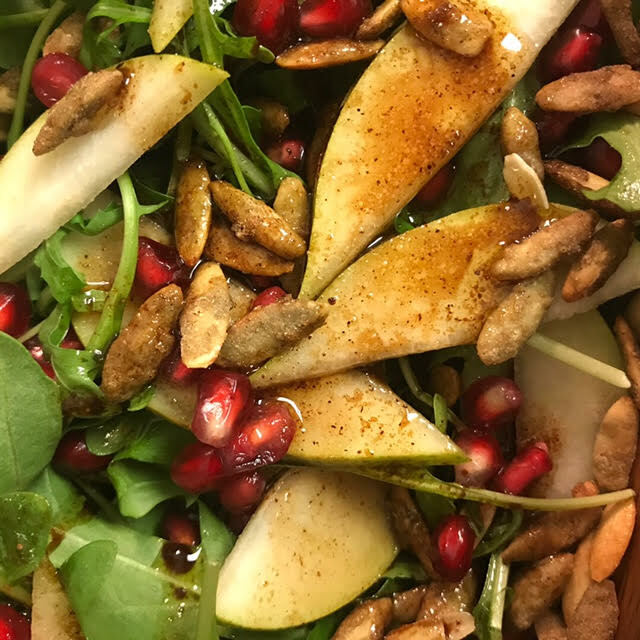 Toss 3-4 handfuls of fresh arugula with thinly sliced pear, pomegranate bits, honeyed goat cheese pieces and pumpkin spiced pumpkin seeds. In a bowl, whisk together honey, sugar cinnamon and nutmeg. Add wine, vinegar and whisk well. Add the EVOO in a slow and steady stream while whisking. Pour all ingredients into a Mason jar ( I always have mason jars of all sizes, at all times) cover tightly, shake well and refrigerate for at least 1 hour (to infuse the flavors). A stunning full, rich Chardonnay perfect for the cooler months; as well as, an ingredient for a sublime vinaigrette. 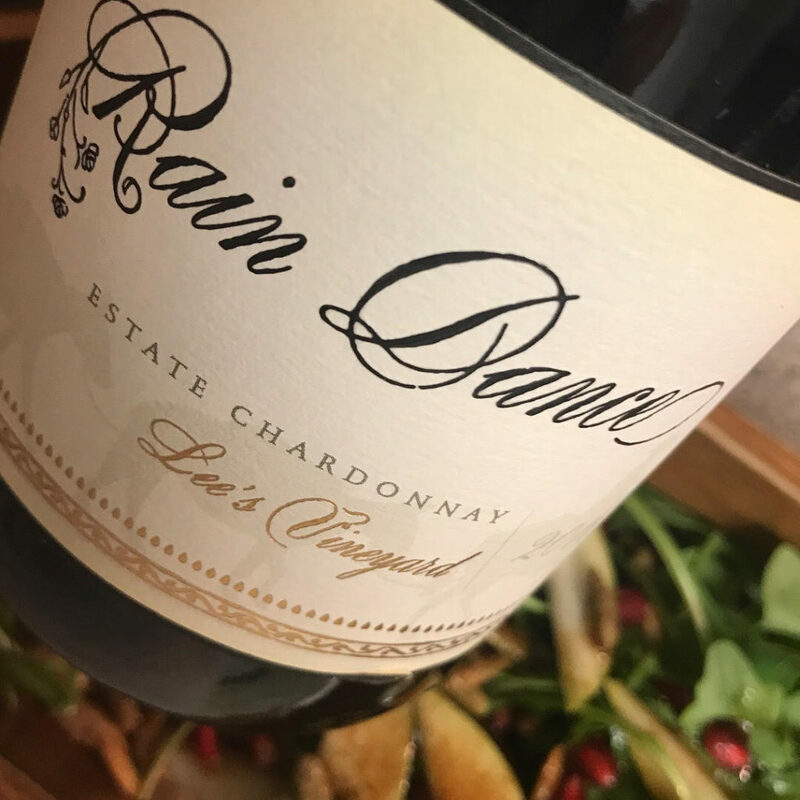 The salad with a glass of the Rain Dance Chardonnay was sublime – it was the ultimate fall-themed food and wine pairing. The characteristics of the wine were perfectly balanced with the flavors of the salad and the vinaigrette. Possibly one of the best tasting vinaigrette dressings I’ve ever made, the salad was also beautiful. Bright red pomegranate pieces popped against the vibrant green arugula leaves. Off-white stone-fruit and stark white goat cheese created a pleasant contrast to the neutral/earthy tones of the seeds and dressing. I was definitely pleased with the outcome, but more importantly, Joe (my husband) and our two boys devoured the meal in its entirety. 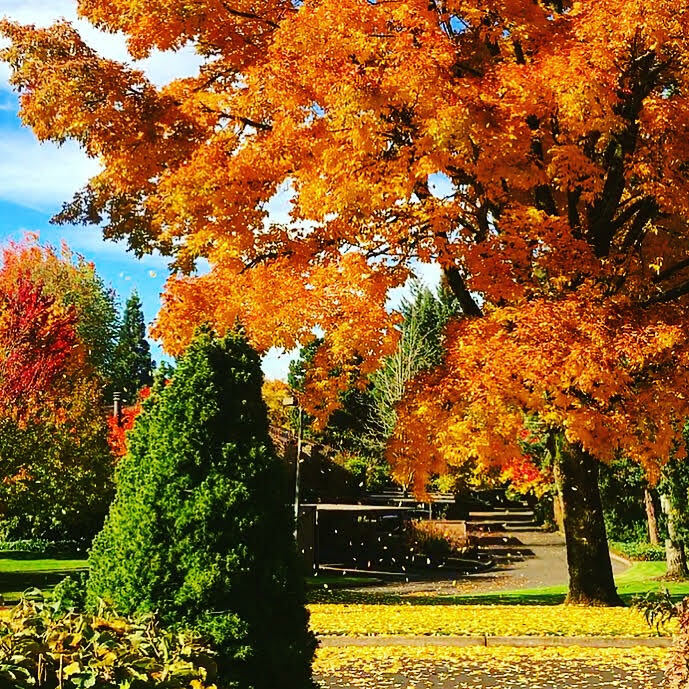 The roots of Oregon’s Rain Dance Vineyards runs deep – seven generations deep. Ken and Celia Austin of Newberg, Oregon, founded Rain Dance Vineyards in 2009, continuing an agricultural and hospitality legacy that began in 1859 when Ken’s ancestors established farming and hotel businesses in the North Willamette Valley. 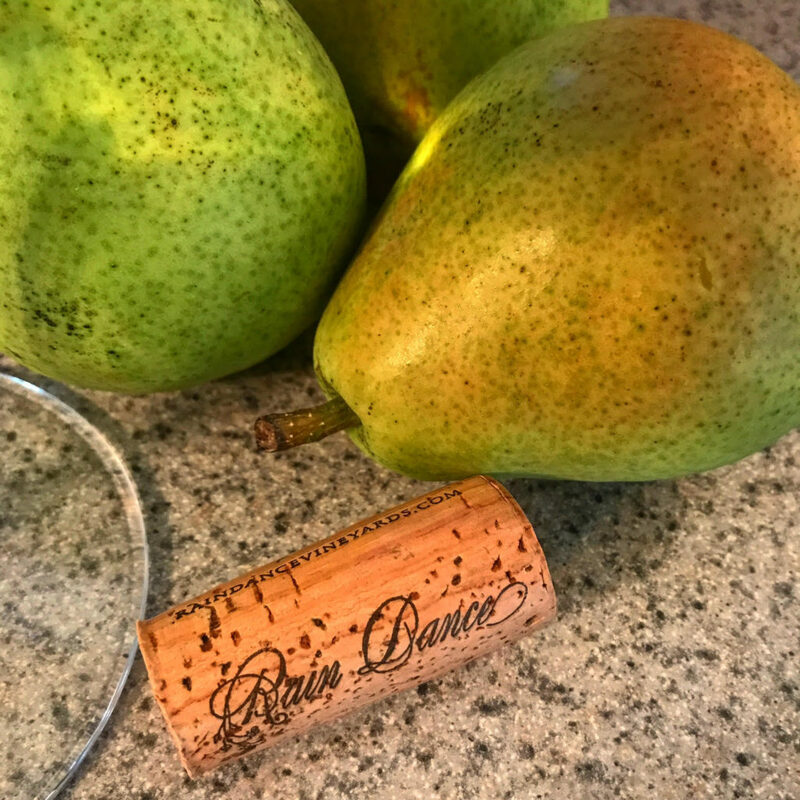 Today, Rain Dance consists of 120 acres of farm land, with 73 acres under vine (Pinot Noir, Chardonnay, Riesling and Gewürztraminer). Wildlife, preserved native trees and over 100 llamas are a part of their sustainability program, which has been a focus from the start; along with meticulous farming and cultivated winemaking. Located in the Chehalem Mountains AVA of Oregon’s famed Willamette Valley, Rain Dance Vineyards is a collection of four estate vineyards that are LIVE and Salmon Safe Certified, dry farmed for sustainability, and their vine by vine composting is a unique approach used for their passion to preserve the native trees. Seven generations of Oregon farming brought the Austin’s to wherer they are today – growing grapes for fabulous wines. As the proud daughter of a West Point graduate, USMA class of ’54, my late father and my personal hero would have enjoyed knowing this tidbit of information: the 2016 Lee’s Vineyard Chardonnay (an inaugural release) is a tribute to a longtime friend and beloved neighbor and veteran of the Austin’s named Lee Anderson. In 2012, the Austin’s acquired Lee’s land and decided to craft this 100% Dijon Clone 95 Chardonnay in his honor. In Ken’s words, “Lee had a heart of gold and would near fall off his horse waving at you when you passed by.” The wine will be available to Rain Dance club members, and the Austin’s will donate $5 from each bottle sold to Homes for Our Troops. Now that deserves a sincere salute.